It's full-on holiday time here in central Pennsylvania. We've already been to a couple of parties and participated in a Christmas cookie exchange. It truly is a yummy time of year. You may not equate snow days with salads, but in my house we eat salads for lunch all year round. Of course, the nature of those salads changes with the seasons: tender young lettuce, snow peas, and radishes in the spring; tomato-rich salads in the summer, and heartier salads in the cooler months. Here are two delicious salads we had this week. One would definitely work for a main dish dinner and the other could also work for a summer picnic. The pictures come from the linked websites (I always forget to take photos!). I've included my thoughts and changes here. 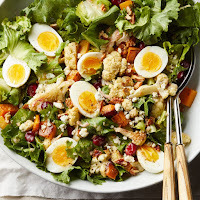 Roasted Cranberry Squash & Cauliflower Salad (from Eating Well). This salad is a definite keeper, and I know I'll make it a couple more times this winter. Because I served the salad as a side to grilled fish, I didn't include the eggs (shown in the photo), but other than that I followed the recipe exactly. You start by roasting butternut squash and cauliflower and then add whole (fresh or frozen) cranberries to the vegetables, roasting until they burst. I was worried that the unsweetened cranberries would be too tart, but the flavors were nicely balanced. The base is escarole, and you add toasted pecans, crumbled blue cheese, and a mustard vinaigrette. We ate the leftovers for lunch for two days. Although not quite as good as it was fresh, the salad held up. Oh, and I'm not quite sure what the eggs would add to the finished dish, but include them by all means if you're so inclined. 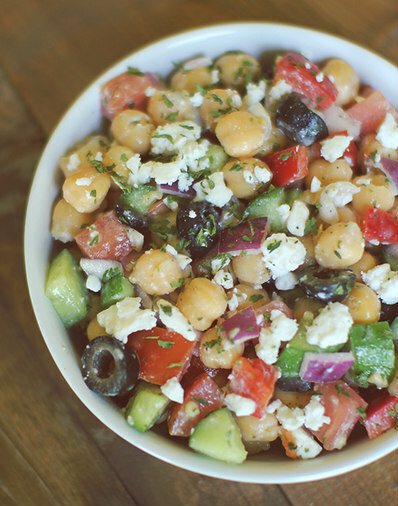 Mediterranean Chickpea Salad (from Dashing Dish). Bean salads generally hold up well for lunches, and this was no exception. I'm sure many of you have a similar recipe somewhere in your (virtual) files, and I bet I do too. I tried this mostly because it looked good (and it is!) and I had a printout in my stack of recipes to try. I made a few changes to the original recipe. First, I didn't use a Roma tomato because, well, it's not tomato season. Grape tomatoes are usually pretty good year round, so that's what went into my dish. I substituted Greek olives for the common black olives shown in the photo and went for full-fat feta instead of low-fat. Finally, I'm not sure why the cucumber is listed with the dressing ingredients, but I cut it up and tossed it into the salad with the other vegetables. The biggest change I made was to the dressing. I didn't use the yogurt because I forgot to buy it, and I didn't use the stevia because I really didn't want the sweetness. I started with the lemon juice, vinegar, and garlic called for and then whisked in olive oil to taste. I also seasoned the salad with oregano. 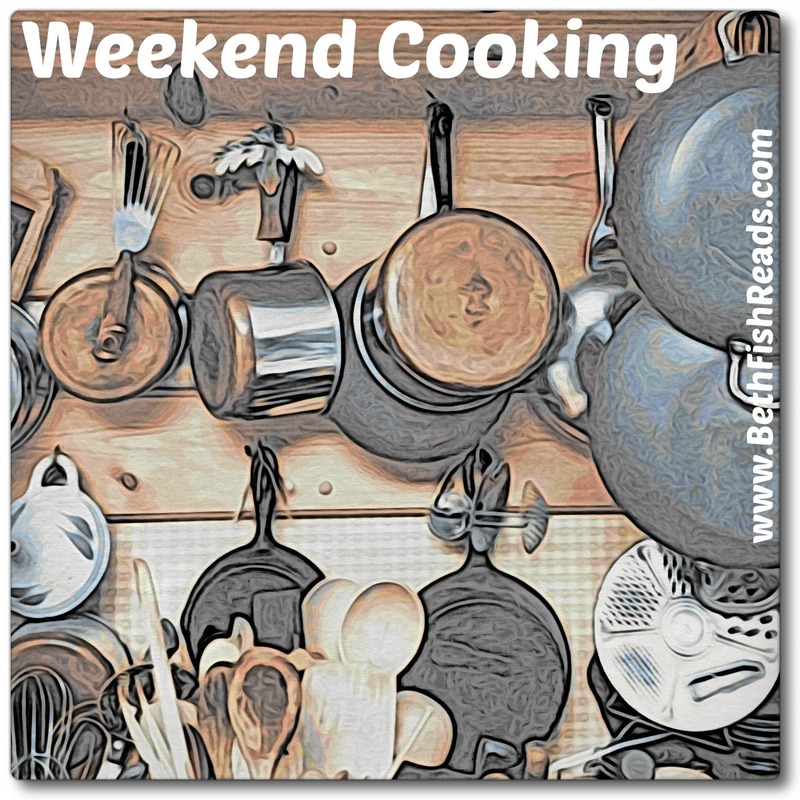 To find the recipes, click the links, which will take you to the Eating Well and Dashing Dish websites, or click over to my Pinterest Tried and Liked board. 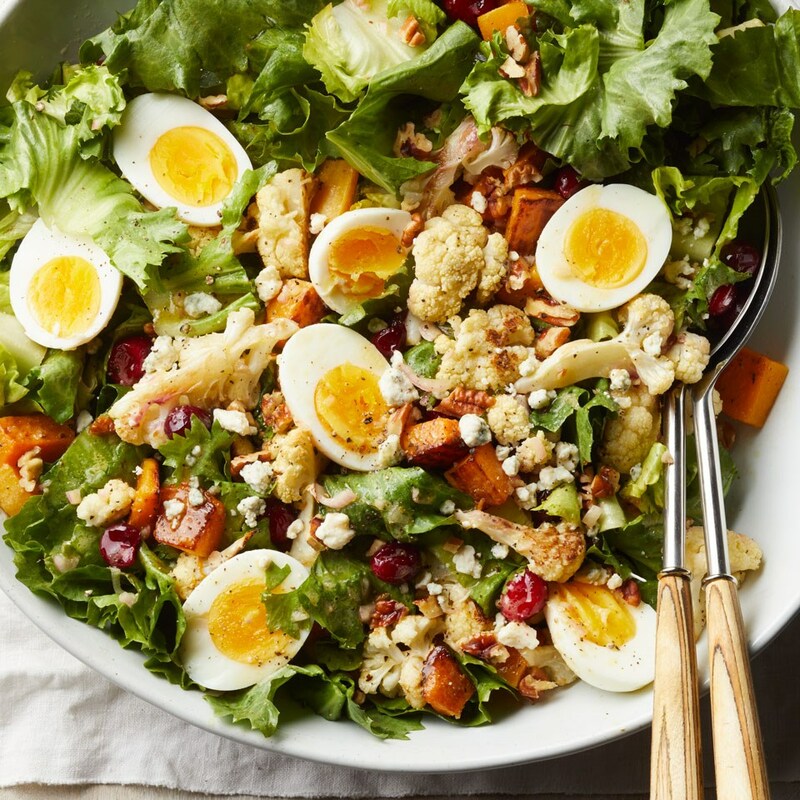 I love butternut squash and cauliflower but never thought to incorporate them into a salad. Thanks for both recipes! Yes, thanks for the recipes, I know I will try the butternut squash salad for sure. I’m always stumped on winter salads. I will add the egg too for protein. 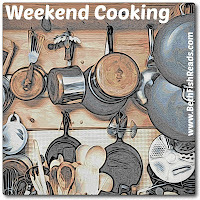 I’m linking with two Foodie posts today. We love salads all year long too. I generally add whatever I have around the house to our salads but do have a few recipes I follow from time to time. I'm going to make note of these 2 to see if I can incorporate them. Some new salad recipes (or reminders of forgotten ones) are welcome in my kitchen! I'd say you changed your second salad to something totally different! I guess the original intent was a Tzatziki type dressing (classic ingredients: yogurt, cucumbers, garlic, salt, etc) which seems unusual on chick peas even though both are frequent in the Eastern Mediterranean. But I have enough of the usual ingredients to make it soon: thanks! Thanks for posting about these salads. I just saved the chickpea salad recipe to make later. I love a good chickpea salad. Salads are hard this time of year. I agree grape tomatoes are the only decent ones available. I threw out radishes this week as they were so woody. Both these salads sound delicious. I think the colors, tastes, and textures of the first salad will complement our Italian Fish feast perfectly! I love the idea of having a salad (or soup) every day for lunch. The both look great, although I think I'd have to make some modifications to suit my hubby (not a fan of chickpeas or cauliflower). Off to peruse your Pinterest board!